The canonization of Marianne Cope, along with Kateri Tekakwitha, on October 21, occasioned the publication of a stunning photograph showing Marianne standing beside the funeral bier of St. Damien in Kalaupapa, Molokai. That was in 1889, and the picture is so sharp that it could have been taken today. It must be the first photograph of two saints together. The holy friendships of Teresa of Avila with John of the Cross, and Francis de Sales with Jane de Chantal illuminated civilization before photography. 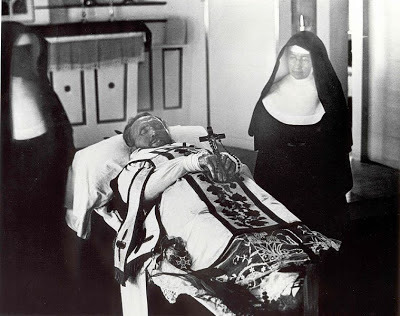 St. Damien’s body is scarred with leprosy but vested in the fine chasuble in which he used to offer Mass. St. Marianne, in her timeless religious habit, shows no sorrow for she obviously knows she is looking at a saint, not knowing that she is one herself. Studying that photograph, one thinks of how hard they worked, not only among the outcast lepers, but all their lives. Damien, born Jozef de Veuster in Belgium, was a farm boy, and Marianne left school in Utica, New York, after the eighth grade to support her family by working in factories. Not in the picture was their helper, Joseph Dutton, a Civil War veteran who was so traumatized by the ravages of war and his broken marriage that he became an alcoholic. He reformed his life, went to Molokai and worked with the lepers for 45 years — cleaning latrines, scrubbing floors, and binding sores — until his death in 1931. Their great happiness would have been clouded to see how much unhappiness there is in our land today. I expect that Gibbon would have understood modern saints no better than he did the early martyrs and confessors, but he would have seen in them a selfless energy that builds noble societies, and the neglect of such energy pulls them down. Our own nation is facing these realities as it decides what it wants to be. The present crisis in culture cannot be resolved if it is addressed only in terms of economics and international relations. The real leaders are not those who hypnotize naïve people into thinking that they are the source of hope. Those who can rescue nations from servility to selfishness are not on slick campaign posters, but in stark black and white photographs like that taken on Molokai in 1889. There are photos and even movies of the Imperial Family of Russia and St. Elizabeth the New Martyr, who were all glorified by the Russian Orthodox Church and are venerated as saints by Russian and other Byzantine Catholics. Of course there are many photos of saints but not of 2 saints together. Besides, that's not the point of Father's post. Possibly the earliest photo of two saints, but not the only one. I have seen photos of Jacinta and Francisco Marto of Fatima together. It's likely some of the martyrs of the Spanish Civil War were photographed together, too. Still: Wow. I like the fact that Sister Marianne is not showing grief in the knowledge that she is looking a saint. How we should all strive to look upon the death of a loved one who dies within the framework of God's grace. I think this might be the oldest photo of two cannonized saints together in one frame. The photos of Jacinta, Francisco are older but they aren't cannonized. If you refer to the N.t., particularly Paul's letters, you will see that all members of the early church were saints; sinners being sanctified. It was later that the uppercase saints, such as these, appeared on the scene as discrimination became common practice.